The contemporary decision-maker is placed in an environment which demands a wider outlook than a narrow laser-like focus on profit and shareholder values. She has to or rather forced to take into consideration the needs, interests and demands of the employees, customers, suppliers, community and the environment. She cannot and should not ignore the factors which lead to immediate commercial success like productivity, profit, quality and customer satisfaction. But she must also take into consideration other factors which determine the long-term effectiveness or sustainability of the organization like employee motivation satisfaction or wellbeing, ethics and transparency, social responsibility, environmental preservation. The future decision-maker must have the ability to assess the consequences of her decisions for the totality of the stakeholder-community. In other words, she must acquire the capacity for holistic decision-making. This article presents a brief outline of the path and discipline for arriving at such a holistic decision. The emerging corporate world is becoming a little too complex for the decision-makers. There are too many demands, pressures, needs and interests which have to be reconciled to arrive at a satisfying-decision. The future decision-maker must have the ability to assess the consequences of her decisions for the totality of the stakeholder-community made of shareholder, employee, customer and the supplier and the still larger social and natural environment. In other words, she must acquire the capacity for holistic decision-making. This article presents a brief outline of the path and discipline for arriving at such a holistic decision. I will safeguard the interests of my shareholders, co-workers, customers and the society in which we operate. The problem is too complex for reason to handle because it requires reconciling the conflicting demands and objectives of a multiplicity of stakeholders. It requires a higher intuition beyond reason; not an infrarational “gut-instinct” below reason but a suprarational insight beyond reason. This doesn’t mean reason has to be set aside. Reason has an important role to play in holistic decision-making. But the final decision can be arrived only by a higher intuition greater than reason. The next question is how to arrive at this holistic and intuitive decision? The path requires a two fold discipline: creating a holistic consciousness and cultivating the intuitive mind. The holistic perspective means what is now called as the “systemic” or ecological view that looks or perceives everything as part of a larger whole. When this perspective is not merely an idea in the upper layers of mind, but permeates the entire consciousness of the individual and becomes habitual to or established in her thought, feelings, action or even in sensations, we may call it as holistic consciousness. How to realize this holistic consciousness? We must learn to think, feel and experience things in a holistic and non-egoistic manner. We have to begin in the mind and in thought but extend it to other parts of the being through a process of imagination, visualization and other forms of inner discipline. Life or Nature is a dynamic, interdependent and interconnected whole “a holomovement” organized in the form of a hierarchy of sub holes. Each individual element is part of a larger whole which in turn is part of a still larger whole. Each part potentially contains the whole or in otherwords the whole is potentially present in each part. The very existence or nature of each part is determined by its relationship with the other parts and the whole. The other aspect of holistic thinking is the non-egoistic attitude. As we have mentioned earlier most of our normal process of thinking is self-centered and ego-centric. Most of our responses to things, events or people is interms of whether it pleases or displeases my ego, give me gladness or pain, flatter my pride, vanity or ambition or hurt it, satisfy my desire or thwart it. If we want to have holistic perceptions, we must think in the opposite way, which means to think as if my ego is not there. The non-egoistic consciousness thinks interms of what things are in themselves and would be if the ego is not there, what is their meaning, how they fit into the scheme of things or how they will serve the work that has to be done or the life of the world or the higher cause or ideal which has to be realized. In the modern corporate context, the holistic manager has to think interms of how to serve the stakeholders better and better or to be more specific how to provide a better quality of life, experience and growth opportunities for the customer, employee and the community and maximize their wellbeing. However for realizing an effective holistic consciousness we must not remain satisfied with thinking. What we think has to percolate into feelings and sensations. The faculty of Imagination can be a great help in making the abstract idea concrete to the mental sensation, which inturn can evoke the corresponding emotions. We must learn to project, expand and widen our heart and mind into the larger whole and feel our own small self disappearing into it or feel it as a part of our own higher and larger self beyond our ego. The other part of the holistic discipline is the practice of what we may call as “Aspiration-Rejection.” Aspiration means conscious cultivation of all that is in harmony with the holistic consciousness in thought, feeling and action, like for example urge for synthesis or reconciliation of opposites and everything that unites,, connects, harmonises, widens or enlarges our consciousness. Rejection means throwing off all that is contrary or hostile to holistic consciousness like for example things which divide people or thing or emphasizes on “eternal” opposites or creates unpassable boundaries. This holistic contemplation and discipline creates a consciousness or an inner environment which is favourable to a higher holistic intuition. Sometimes, the very effort or stretching of our ordinary mental consciousness to comprehend the larger whole may lead to a holistic non-rational perception or insight. However if the mind is too much in tension and turmoil the emerging insight may get diluted or distorted and falsified by the disturbances in the mind. So a passive and relaxed silence in the mind is essential for receiving the holistic intuition. This combination of thinking and silence may appear contradictory. But there is no contradiction here. The thinking prepares the mind for receiving the intuition in silence. We must keep in mind that a narrow, selfish and egocentric mind cannot receive the holistic intuition by merely silencing the mind. To receive this higher intuition there must be a mental soil or environment similar or favourable to it. The type of holistic thinking and discipline which we have described earlier helps in creating such a mental soil and environment. However as we have indicated earlier, inorder to arrive at the final holistic decision, the decision-maker has to sit in inner silence to receive the intuitive idea, the spark of light, which indicates precisely the right choice or course of action. The path for opening to this higher intuition has four facets: purification, silence, introversion and vigilance. We have already described the discipline of purification, which means rejection of all thought, feelings and impulse which are contrary or hostile to holistic consciousness. Along with this rejection we have to keep the attitude of disinterestedness and impersonality, without any eager or anxious seeking for results. The inner aspiration has to be towards truth and knowledge and not for some personal gains. This inner purification brings a certain inner calm which has to be consciously deepened into a complete silence. In this silence, consciousness has to be turned inward to the spiritual source of our being in a state of alert and receptive passivity. The decision-maker has to offer the decision-problem or the decision-situation to a higher consciousness beyond the rational mind deep within the heart or above the head, and wait in a receptive and concentrated silence for the intuitive idea to raise from within or descend from above. The fourth factor is vigilance and consciousness. When the intuition descends from above or raises from within, we must be mindful, vigilant and alert to receive and assimilate its contents. Carol Sanford and Pamela Marg, ‘A Work in Progress at Dupont: The Creation of a Developmental Organisation, (ed) Michael Ray and Allen Rinzler, The New Paradigm in Management, World Business Academy, Newyork. 2 months of Premium Web hosting for FREE! I’d ought to consult with you here. Which is not some thing I usually do! I enjoy reading a post that could get people to think. Also, thank you permitting me to comment! wonderful issues altogether, you just gained a logo reader. What would you recommend about your publish that you made a few days ago? Any sure? Coba cari celah di dalam permainan bandarq ini. Poker on-line indonesia terpercaya terbaik. 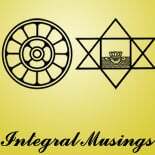 This entry was posted on July 18, 2012 by integralmusings in Integral Management.